Mass Effect is a trilogy that should be available on the players’ platform of choice without leaving the story crippled. PS3 players don’t have the opportunity to play the whole story, to know the feeling of defeating Saren or understand the threat the Rachni pose to the galaxy and we miss out on the history between Shepard and Cerberus that plays a huge role in ME2. Not to mention the numerous cameo’s, dialogue differences and relationships that make the Mass Effect experience complete. 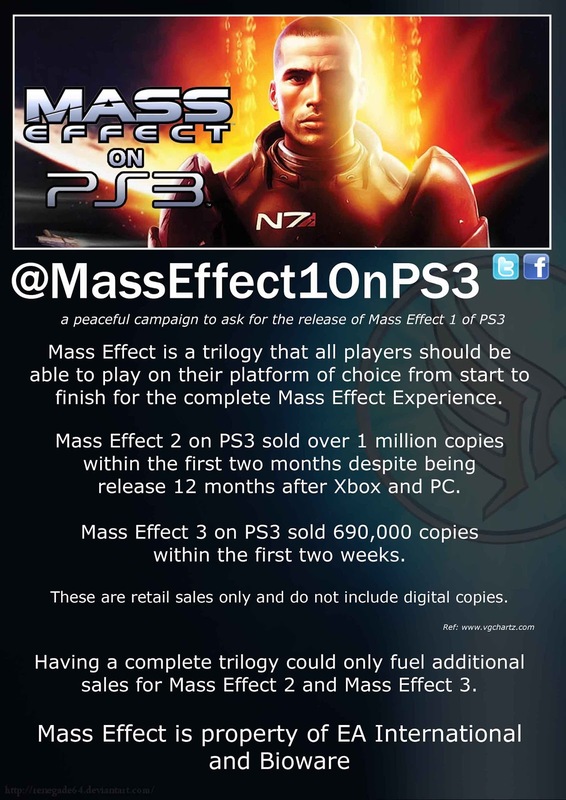 If you support the possible release of the Original Mass Effect on PS3 to complete your trilogy join us here and @MassEffect1onPS3 so EA and Bioware can see there are PS3 players who are passionate about completing their Shepard’s journey from start to finish.